The directors are well known in the industry through other travel services provided, but as a new division, it was essential that the ANZ Tourism brand attract the attention of the target market and reinforce the brand values of honesty, reliability and integrity. Exclusivity of the customised product, professionalism, local expertise and the friendly, welcoming service excellence of the team, needed to be conveyed. 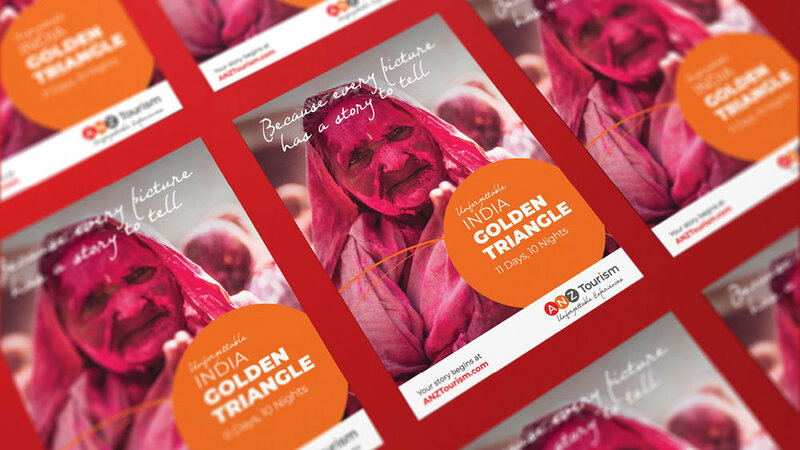 A visual identify was created integrating the three different destinations of Australia, New Zealand and India. What was important was that any logo and messaging needed to differentiate the positioning of ANZ Tourism, so as not to be mistaken for a tourism board. To ensure this, Dovetail designed a logo incorporating the use of three different colours relevant to each country. Included in the brand language are easily identifiable, fun images of icons depicting each country, that is, a koala for Australia, elephant for India and a fern for New Zealand. In addition the use of the tagline “Unforgettable Experiences” was suggested to convey the message that a travel experience planned by ANZ Tourism, is exclusive, unique and truly unforgettable. A modern, fresh and fun design was applied to the website with the uniqueness of the three countries portrayed through inspirational images, bold typefaces and exclusive travel offers which can easily be updated by the client. All customer touch points, including stationery, brochures and social media have been updated resulting in a significant increase in customer engagement and increased sales across all markets.